Well it’s time to introduce the update of our Android app. So, let’s find out what’s new in version 2.1. Now it’s up to you whether you need the Firewall feature or not. So, yeah, this feature can now be enabled and disabled. Very useful if you were setting different preferences for different apps and now would like to temporarily disable Firewall and won’t lose all the settings herewith. This feature allows to return the Internet access with one tap. Let’s say you have prohibited some app (like Maps or any other using geolocation) to go online without you knowing. But when you need the app to connect to the Internet immediately – you no longer have to open Adguard, go in Firewall and change the settings. Now you can regain access to the network right in the app. Most of users don’t really need them. Such settings were made to make the troubleshooting faster, to solve some very rare problems or for a really specific configuration of the program. Now we won’t spend time on the assembling of a special version for your device and you – on its download and installation. We will be able to tell right away what to change to solve the problem. So the support is now easier, and these settings are needed to parse some tricky bugs. pref.vpn.ipv4.force.default – disables the routes we use to exclude LAN from filtering. 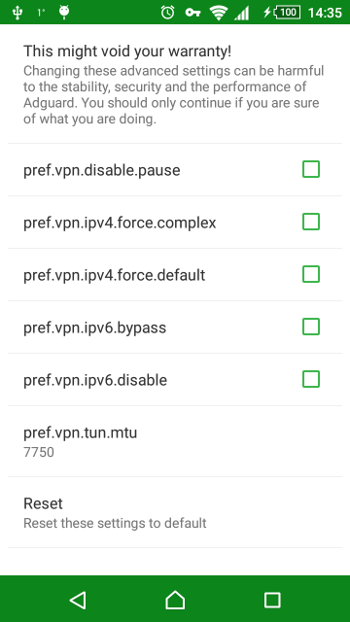 pref.vpn.ipv4.force.complex – settings reverse to the previous one. Regardless of the network configuration using the routes excluding LAN. Usually, we do not exclude the LAN networks with a complex configuration. This setting will bypass the restriction. pref.vpn.ipv6.bypass – forcibly exclude filtering of IPv6 networks. In this case, IPv6 will work, but will not be filtered. **pref.vpn.ipv6.disable **- forcibly disable filtering for IPv6 networks. In case,IPv6 will not work at all. **pref.vpn.tun.mtu **- the maximum size of the data package, which is used in VPN. In general, the rule is – the larger the package, the less CPU time spent on creating packages from the program, and the faster everything works. On the other hand, when the size is too large, VPN may cease to work at all, or fail to start. The recommended interval for the experiments is from 1500 to 9000.
pref.vpn.disable.pause – (#84) disable Adguard automatic restart functional when disconnecting/connecting to the network. Why needed? When the VPN is enabled, routes are built in accordance with the current network configuration on the device. 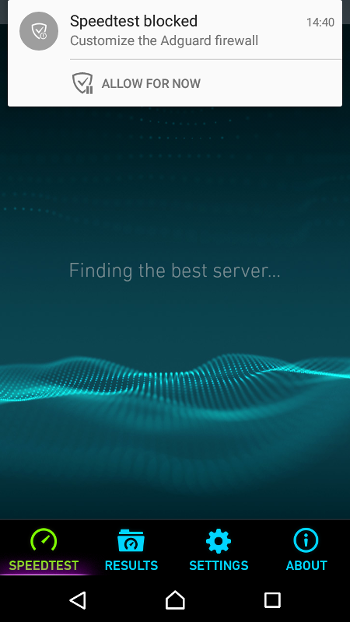 Sometimes it happens that when you connect to another network, these routes no longer correspond to the new configuration, and VPN ceases to operate. Automatic restart is needed to avoid this situation. To ‘catch’ the requests to DNS servers (which resolve domains in IP) we had to set the preferences for our VPN, which provide access to some server outside the current network. We used one Google’ and one Yandex’ servers. But it turned out that there are providers and tariffs which block access to the external servers. Now, we look at what DNS server the user has. Then set some fake DNS in VPN settings. And when the query is executed to this fake server, we change the address with the one that the user has. We would love to point out that we always take into consideration all your suggestions and complaints. As you can see, after we became an opened project at GitHub, many of you joined us there and gave a lot of useful feedback that really helped with improvement of Adguard. 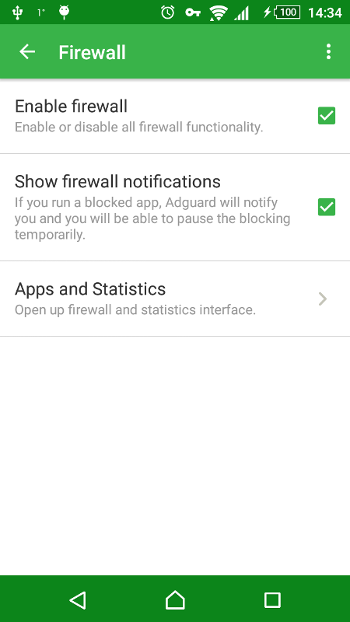 It also has to be mentioned that not a long time ago we made Adguard available to download on Amazon Appstore. It has an option of monthly subscription along with usual license-based operation. And, of course, the base functional like in-browser filtering or Firewall is free. Dear friends, today we release new beta version of fully upgraded Adguard for Windows. This means that Adguard 6 official and long-awaited release will be really soon!